A carbon tax can lower emissions, but it needs to be pretty damn high. Carbon taxes are in the news these days. In recent months, not one but two conservative national carbon tax proposals have emerged, disrupting the usual partisan dynamic on climate policy. First there was the proposal from the Climate Leadership Council, a group of (mostly older, retired) Republicans and centrists, which was released last year but recently gained the backing of a new big-money conservative PAC. 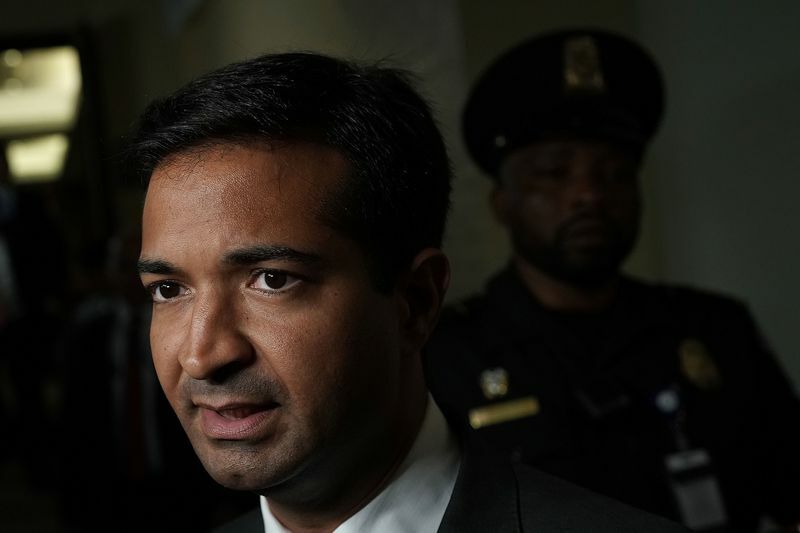 Then, in July, Rep. Carlos Curbelo (R-FL), co-chair of the House Climate Solutions Caucus, released a carbon-tax proposal of his own. Now, ExxonMobil has announced it’s endorsing the CLC proposal and is putting up $1 million to lobby for it. Neither proposal has a snowflake’s chance in hell of passage any time soon. And the House passed a resolution this summer trying to squash even the possibility of a carbon tax. But the existence of these proposals does indicate a heightened level of awareness of and interest in carbon taxes. So now seems like a good opportunity to review some of the basics. Luckily, the Center on Global Energy Policy (CGEP) at Columbia University (in conjunction with several other research organizations) recently issued a series of four research papers covering those basics. The research didn’t turn up anything particularly shocking; it mostly confirmed what policy wonks have long understood about the dynamics of carbon taxes. But those dynamics aren’t necessarily well understood by the public. With the (slim but growing!) chance that a federal carbon tax could be the subject of serious national debate, it’s a good time for everyone to get up to speed. Can it reduce greenhouse gas emissions? What economic sectors will it hit hardest? What overall effect will it have on the US economy? Will it be fair and equitable? Will it be enough to address climate change? Let’s walk through what the research shows, one answer at a time. The CGEP research pivots around a few shared scenarios. 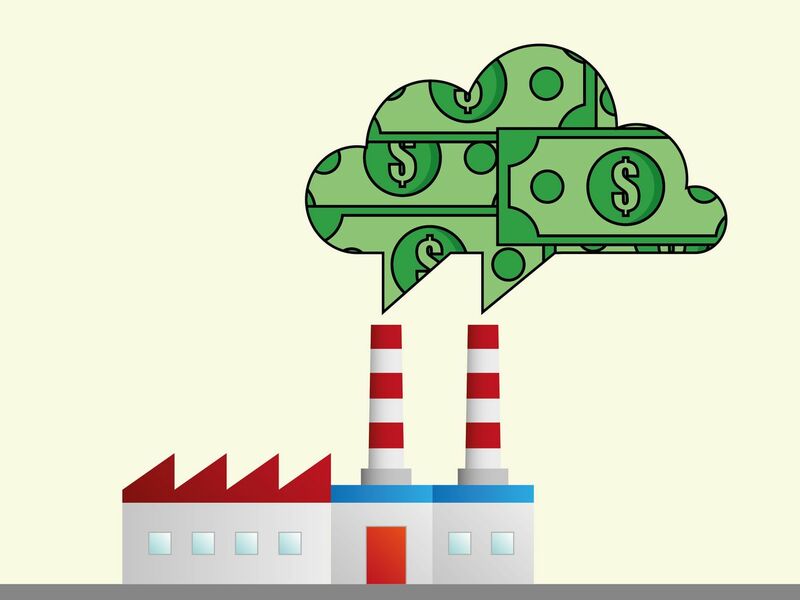 Researchers modeled three different carbon taxes — starting at a per-ton rate of $14 (rising 3 percent a year), $50 (rising 2 percent a year), and $73 (rising 1.5 percent a year) respectively — with a range of fairly conservative assumptions about energy prices and technology development. The $50 tax served as the central case. In all cases, the tax would be charged “upstream,” where carbon enters the economy, at the wellhead, mine shaft, or import terminal. The tax would ultimately cover more than 80 percent of the economy’s total greenhouse gas emissions. The independent research firm Rhodium Group, which analyzed the energy and emission effects of a tax for CGEP, found that, sure enough, it will reduce greenhouse gas emissions. 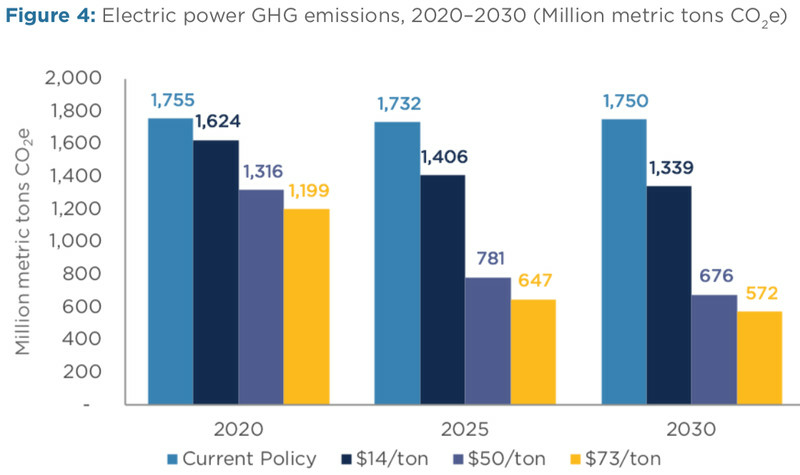 As the low-hanging fruit is consumed, emission reductions start getting more expensive. 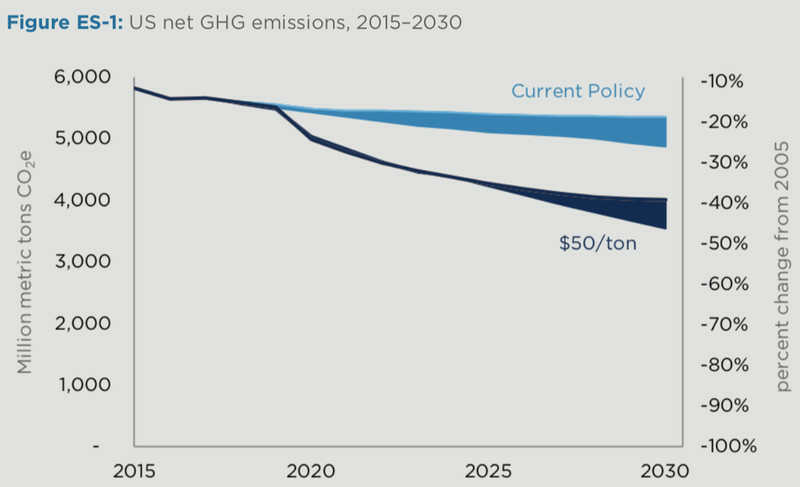 To get to 80 percent (or more appropriately, 100 percent) reductions, carbon prices would likely need to exceed $100/ton by mid-century. A carbon tax can reduce emissions quickly, but in the early years, reductions come overwhelmingly from a single industry: electricity. The most striking result of the Rhodium research is that more than 80 percent of the emission reductions achieved by a carbon tax through 2030 would come from the electricity sector. More specifically, they would come from the accelerated decline of coal. The same is not true for other sectors of the economy. In particular, transportation appears stubbornly resistant to carbon prices. 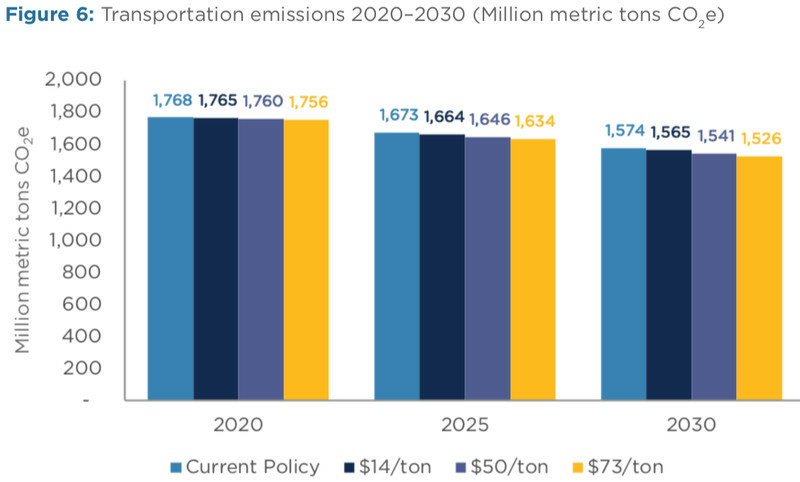 Through 2030, a $50 carbon tax would reduce emissions from the transportation sector all of … 2 percent. First, there aren’t easily available short-term substitutes in transportation like there are in electricity. In the electricity sector, operators can easily ramp down coal plants and ramp up natural gas plants. But in transportation, without commercially available liquid-fuel alternatives, the only way to reduce emissions quickly is to drive less, and driving behavior has proven resistant to price pressure. Second, carbon taxes put more pressure on operating costs than on capital costs. The electricity sector is weighted toward operating costs (the power plants are mostly already built), while the transportation sector is weighted toward capital costs, i.e., the cost of buying the vehicle. A carbon tax affects the cost of running a power plant much more than it affects the cost of buying a car. The results are not quite as stark for the industrial and building sectors, but they are pretty close. Those sectors are somewhat more amenable to price-driven carbon reductions than transportation, but not nearly as amenable as electricity (though the researchers note that uncertainty is higher in those sectors, since reporting and data are not as consistent). House Majority Whip Steve Scalise, who sponsored the anti-carbon-tax resolution. The Baker Institute for Public Policy at Rice University did the research on a carbon tax’s macroeconomic effects. In a nutshell, the macroeconomic effect of a carbon tax varies depending on what the government does with the revenue. The key point, though, is that in every scenario, the macroeconomic effect is small — well under 1 percent of GDP in either direction. The fact is, even a relatively large carbon tax won’t dramatically affect a $20 trillion economy. In practice, the macroeconomic effects of any carbon tax are likely to be lost amid larger demographic and economic trends. Using it to reduce the national debt boosts GDP 0.3 percent but reduces consumption by 0.4 percent. As I said, all of these effects are relatively small, which suggests to me that macroeconomic effect should not be the deciding factor in how to design a carbon tax. It may be that a small marginal decline in the rate of GDP growth is a small price to pay for more justice, or emission reductions, or political durability. One other note here: It is irksome that the only scenarios modeled are revenue-neutral. All the revenue is returned, none left for government spending. As I’ve written before, that is an essentially conservative restriction on carbon-tax design. There’s no reason climate hawks should go along with it. The US is nowhere near overtaxed and we have lots of big spending needs if we’re going to address climate change (like, say, a Green New Deal). So why not rebate (or reduce payroll taxes) enough to protect low- and middle-income Americans and then use the rest for clean energy infrastructure and transition assistance for vulnerable communities? 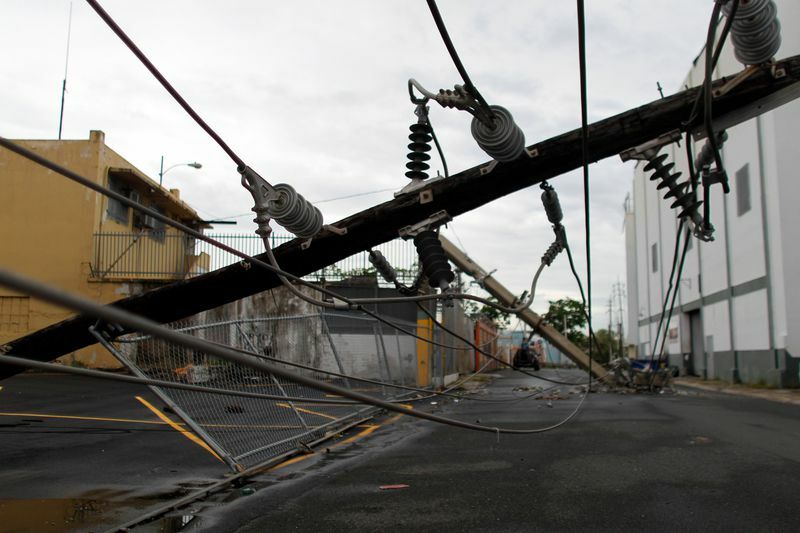 A good target for some government spending in Puerto Rico. “Economic models in this space are typically not designed to do revenue positive scenarios,” he told me, “and in my experience, modelers are uncomfortable with the idea of projecting the economic impacts of additional government spending.” He hopes, as do I, that modelers get a little more adventurous in this respect. Of all the reasons to make a carbon tax revenue-neutral, “difficulty modeling anything else” is among the worst. A carbon tax is, in and of itself, somewhat regressive. It hits the poor harder than the rich because the poor spend a larger percentage of their income on energy services. However, it also generates a lot of revenue — between $740 billion (in the $14/ton scenario) and $3 trillion (in the $73/ton scenario) over 10 years — which can be used to offset the regressivity. So the distributional effects of the tax depend on how the revenue is used. We can design a progressive carbon tax if we want one. 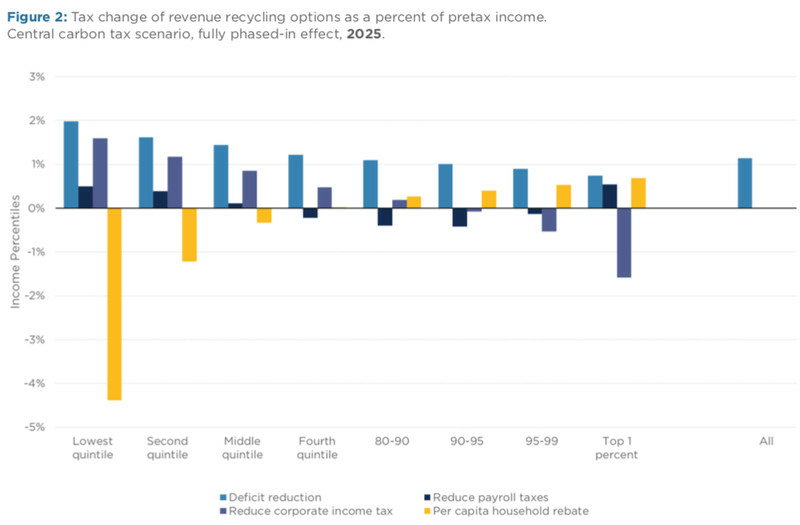 When revenue is used to reduce the deficit, a carbon tax is moderately regressive—that is, it increases taxes by a larger percentage of income for lower-income households than for higher-income households. Using revenue to reduce the corporate income tax (beyond the corporate tax cut in the recent Tax Cuts and Jobs Act) would result in higher taxes for low-income families and disproportionate benefits for higher-income taxpayers. Using revenue to provide lump-sum rebates would more than offset the carbon tax burden for low- and middle-income taxpayers but leave high-income families with a net tax increase. Using carbon tax revenues to reduce employee payroll taxes would result in a net benefit for upper middle-income taxpayers, while increasing tax burdens modestly for low-income and the highest-income households. So if you’re aiming for the most net-progressive tax, you use the revenue for rebates — helps the low-income, raises taxes on the high-income. If you’re aiming to appeal to the middle class, you use the revenue for payroll tax reductions — helps the middle, increases taxes on either end. If you’re looking to be a soulless plutocrat, you use the revenue to (even further) reduce corporate taxes, thus helping your wealthy buddies and screwing everyone else. And if you’re a daft “centrist” gripped by baseless fears about the deficit, you use the revenue to pay down the debt and pat yourself on the back even as everyone is worse off. Ahem. It’s pretty clear that anyone concerned about the welfare of low- and middle-income Americans is obligated to support a carbon tax design that sends at least some of the revenue back to them — at least enough so that they suffer no net harm to their pre-tax income. But, again, I’m irritated by the background assumption that all the revenue must be automatically returned, that the tax must be revenue-neutral. I’d like some modeling that reveals exactly how much of the revenue must be returned to hold low- and middle-income Americans whole. I suspect there would be quite a bit left over to spend on clean energy. Here we depart from the Columbia research and I add one answer of my own. The economic theory behind carbon prices is that, if carbon is priced correctly — i.e., at the true “social cost of carbon” — then the economy will respond with the optimal level of carbon reduction. There are all kinds of difficulties with this theory, not least determining the social cost of carbon, which is as much art and ethics as it is science. And some researchers believe that the true social cost of carbon may be much higher than today’s estimates, as high as $250/ton. Theoretically, carbon taxes can achieve any level of emission reduction. Just crank the price up — change the model inputs until you get the outputs you need. But politically, carbon prices have been constrained far below optimal levels. Nowhere, in practice, are they doing enough on their own. To me, all of the above suggests a simple conclusion: Carbon taxes are good policy, an important part of the portfolio, but unlikely ever to be sufficient on their own. It’s worth getting a price on carbon anywhere it can be gotten, but climate hawks should not believe, and definitely shouldn’t be saying in public, that a carbon price is enough, that it’s worth trading anything and everything for, that when we implement it, we are done. For one thing, it’s unlikely to be high enough. For another, it strikes me as unwise to leave other sectors unreformed for a decade or two while we clean up electricity. If that happens, we could reach 2030 or 2040, run out of coal to retire, and find ourselves needing very rapid, very large reductions from those other sectors, for which we will be ill-prepared. I asked Kaufman, the director of Columbia’s School of International and Public Affairs, about this as well. He noted that “it’s a feature rather than a bug of a carbon tax policy that its near-term effects are concentrated in one industry.” That should serve to reduce political opposition from oil and gas. Carbon pricing, whatever form it comes in, will almost certainly need to be supplemented with technology research, development, and demonstration policies; pollution regulations; and spending on infrastructure, adaptation, and transition assistance. A carbon price supports, funds, and accelerates the effects of those other policies (which is great! ), but it is not a substitute. The proper target for advocacy is action sufficient to reduce emissions to net-zero carbon as fast as practicably possible. What limits that effort is not ultimately the choice of policy instruments, but the constraints of political attention, organization, funding, and intensity. Loosen those constraints and everything, including a carbon tax, gets easier.